This article is about the game Mario Paint. For the WarioWare: Touched! microgame based on the game, see Mario Paint (WarioWare: Touched!). For the WarioWare: D.I.Y. microgame based on the game, see Mario Paint (WarioWare: D.I.Y.). Mario Paint is a title on the Super Nintendo Entertainment System. It was originally bundled with the SNES Mouse accessory, and was one of the few games to support it. The game received a Player's Choice reissue. The title screen of Mario Paint. Several objects falling after the player clicks on the star. The title screen is notable for being highly interactive - each letter causes a different effect on the game title screen. M - Shrinks Mario. If clicked again, returns him to normal size. Similar to the effects of getting hit or gaining a Super Mushroom. A - The letter A will fall down through the screen, and then go back to its place. If Mario is under the A when it falls, he'll be knocked off-screen along with it, and also come back. R - An eye will appear on the R, and it makes a baby noise, and crawls off and back on screen. It makes the noise again. If the noise is played backwards, it sounds like a voice saying, "Nintendo." I - Causes all black and white colors on screen to invert, including those on Mario. Also causes the title music to become distorted. P - Replaces the title setting with a green field with trees, cars, animals, UFOs, shooting stars, and other moving objects, most of which make a sound when clicked. Clicking P again returns the title to normal. The music changes during this sequence, to a slower version of BGM 1 from the main game. A - Yoshi runs across the screen, along with drum sound effects while he's visible. I - All text on screen begins shaking, and the music is distorted. N - Credits appear onscreen. The music continues, but is accompanied by some extra background instruments not normally audible. If the game is started when the programmer is credited, some bonus features will be available. 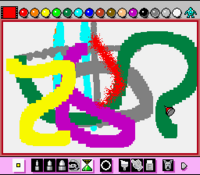 T - The player can draw using a rainbow texture with a thick crayon. The title music slows down, but keeps playing. Clicking on Mario will start the main game. Clicking on a falling Star after clicking on P will cause several objects to rain down the screen. The music will then change to harp music. The open canvas is the main part of the game. Here the player can draw with three sizes of pencil tools, paint, and use preexisting sprites (Called "Stamps" by the game) of things from basic houses and trees to sprites directly from Super Mario World. Additionally, the player can use a straight line tool, and add numbers and letters from a text menu. Erasing images can be done with a traditional erase tool, as well as several amusing screen transitions which wipe the screen clean. There's also an option to completely fill the screen with a certain color, texture, or sprite. To undo an action, the player has to select Undodog's icon. In addition to the default stamps, the game has room to save 15 custom sprites at any given time, which can be made in the Stamp menu. The player is given a grid and can create sprites pixel by pixel using a variety of colors. If a single pixel wide stamp is created it can be used as a pen that is much thinner than the one the game normally allows the player to use. In addition to creating visual works of art, the player can also create their own songs in Music Mode. Using a set of stamp icons to represent different instruments, they can be placed along a music score, creating a melody. Songs can be written in 3/4 or 4/4 time. The game has three default songs, one of which remixes the main Super Mario Bros. theme by Koji Kondo. The songs created here can be used in Animation Mode. Undodog also appears in this mode helping players undo previous actions. The music mode has become a viral hit and many song compositions can be found on YouTube and other gaming sites. 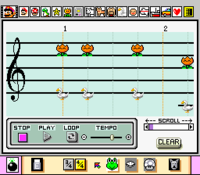 The Music Mode was recreated as a fan-made Windows program called Mario Paint Composer and added several features such as longer song length, more notes per beat, more sounds, and the ability to save. This program lacks the jumping Mario which was shown when a song is played. Also the player using it is apparently able to upload songs to the net, however trying to do so will do nothing. The player can create their own looping animation, frame by frame with a frame limit, and then set them into motion on top of the background they have displayed in their main canvas. Additionally, if they so choose, their animation can be accompanied by their selected song in Music Mode. Not an art creation section, but a minigame in which the player must use the SNES Mouse to swat different fly-like enemies. Completing stages causes Mario characters to walk across the screen. This game was also a microgame and minigame in WarioWare, Inc.: Mega Microgame$!. It can be accessed by clicking the toolbar arrow on the bottom bar, and then, in the same bar, clicking the coffee cup icon. The game also appears as one of 9-Volt's microgames in WarioWare: D.I.Y., and later as a microgame in Gamer from Game & Wario, under the name "Super Fly Swatter". BGM Setting - The player can choose one of three background songs (or no music) to accompany them as they draw and paint. If the music is turned off, a sound of Undo Dog sneezing will occasionally be heard. Mouse Speed - Choose between Slow, Medium, and Fast. Save/Load/Coloring Book - The game can save one canvas at any given time, and it can be brought back up using the Load option. These sequences are accompanied by the image of a robot processing data with techno music. Coloring Book has four default black and white saved canvases that can be quickly loaded onto the screen. Frame - Simply gets rid of the upper and lower menu option icons, and replaces them with a black frame. Clicking the option again goes back to normal mode. 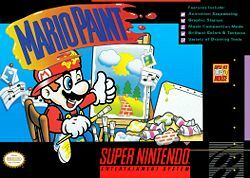 Mario Paint was rated the 162nd best game made on a Nintendo System in Nintendo Power's Top 200 Games list. Instead of being delivered in Flash format like the rest of the series, the first episode of Homestar Runner was animated using Mario Paint. A primitive introduction video made with Mario Paint can be found in the museum of the site. A later short in the series, Strong Bad is a Bad Guy, was made using Mario Paint. Prominent video game developers have cited Mario Paint as an inspiration. Masahito Hatakeyama, one of the designers for WarioWare: D.I.Y., cites Mario Paint's drawing and music creation tools as inspiration for the drawing and music creation tools in D.I.Y., while several staff members of the development team cited it as the game that taught them the joy of developing video games. One of the sound staff from Mario Paint, Hirokazu Tanaka, later went on to work on EarthBound. Some of Mario Paint's sound effects and musical instruments were used in both games. The hidden picture inside Mario Paint Yuushou Naizou Ban. Mario Paint Yuushou Naizou Ban (マリオペイント優勝内蔵版) is similar to Mario Paint BS Ban, but it also has a hidden picture - identified as "Dreaming of the Moon" (「月を夢見て」) by Mizota Hiroko (溝田 祐子) from the Mario Paint contest - which can be found by using the "Load" option in "Save/Load/Coloring Book". For this subject's image gallery, see Gallery:Mario Paint. 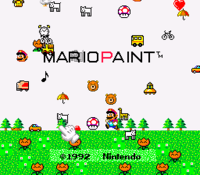 For a complete list of media for this subject, see List of Mario Paint media. Mario Artist: Polygon Studio: The "exercise" cutscene from Mario Paint is recreated in this game, and the two figures within it appear as helpful NPCs, with one of them being referred to as "the Baker". The baby face also occasionally appears in the background of the polygon viewer and makes its signature noise when clicked on. WarioWare: Touched! : A microgame based on Mario Paint appears in this game. The Turntable souvenir features an arrangement of the art mode background music, which is also used in the microgame. WarioWare: D.I.Y. : Another microgame based on Mario Paint appears in this game. Super Mario Maker: Many features are used again in this game, such as Gnat Attack, the Undodog, the interactive title screen and others. Super Smash Bros. for Wii U: An arranged medley of songs from Mario Paint can be played on the Miiverse stage in this game. Super Mario Odyssey: Multiple Crazy Cap costumes are based off of Mario's appearance in some pieces of Mario Paint artwork. WarioWare Gold: The baby face, along with its sound, makes several appearances. Upon starting the game, a short cartoon will play. This cartoon involves two primitively drawn characters, one of which is doing situps while the other holds his feet. The cartoon is almost entirely white save for the outlines of the characters, and takes place in an iris shot in an otherwise black background. 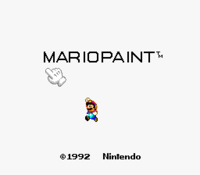 During the cartoon, chanting can be heard, after which the chanters say "Mario Paint!" and an unseen audience yells "Whoa!" as the situp man does a handstand. On other times that the game is running, the audio will instead be cheering, accompanied at the end by a little fanfare. When playing the game for the first time, using the Load option will load the car seen on the back of the box. ↑ Satellaview History Museum lists events from November 1997, including the "Mario Paint Contest"
This page was last edited on April 13, 2019, at 23:50.